When: Wednesdays from 6:00–8:00 PM. CURRENTLY ON A BREAK. CHECK BACK LATE MARCH FOR UPDATES. 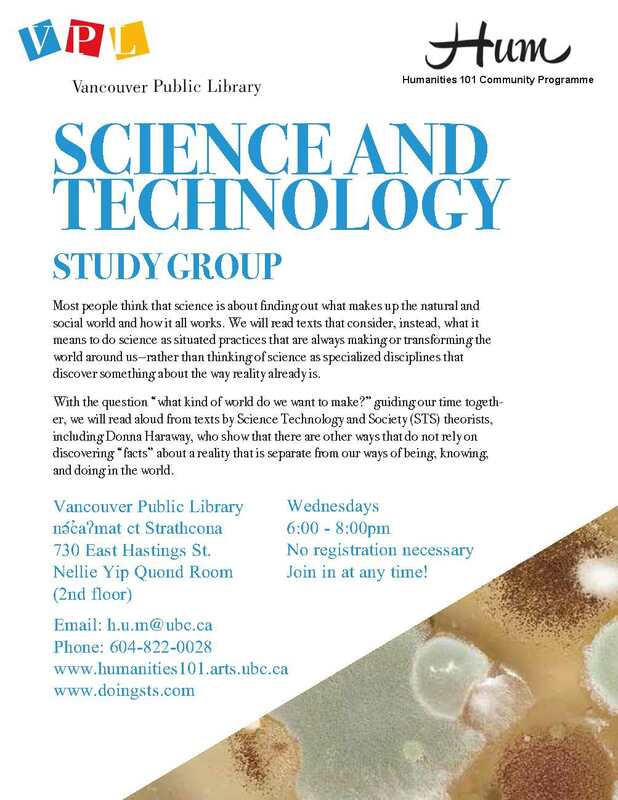 Where: Vancouver Public Library, nə́c̓aʔmat ct Strathcona Branch, 730 East Hastings St. Nellie Yip Quong Room (2nd floor). Most people think that science is about finding out what makes up the natural and social world and how it all works. We will read texts that consider, instead, what it means to do science and technology as situated practices that are always making or transforming the world around us—rather than thinking of science and technology as specialized disciplines that discover something about the way reality already is. With the question “what kind of world do we want to make?” guiding our time together, we will read aloud from texts by Science Technology and Society (STS) theorists who show that there are other ways that do not rely on discovering “facts” about a reality that is separate from our ways of being, knowing, and doing in the world.